Gently fold together the whipped cream and lemon curd. Place one cookie on each serving plate. 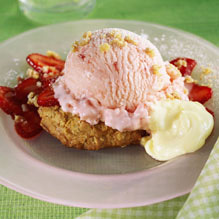 Place some of the strawberries on each cookie. Top the berries with a scoop of ice cream, then a generous spoon of the lemon cream. Gently crumble one cookie over each ice cream scoop. Sift powdered sugar over the top of each and serve. Place the oats on a cookie sheet and toast in a 300°F oven until lightly browned, about 10 to 15 minutes. In an electric mixer, cream the butter with the vanilla, baking soda and salt until the butter is well softened. Add the sugars and mix until light and fluffy. Add the nuts and mix briefly. Using a spatula or wooden spoon, fold in the oats and flour making sure ingredients are well-combined. Roll the dough into 1 1/2-inch balls and gently flatten them to about 1/2-inch thick disks. Place the rounds on a cookie sheet leaving enough space in between to allow them to spread during cooking. Bake the cookies at 350°F for about 15 to 20 minutes or until lightly browned and still slightly soft in the center.